Hello! As I bet you can tell, I'm in the hospital right now. 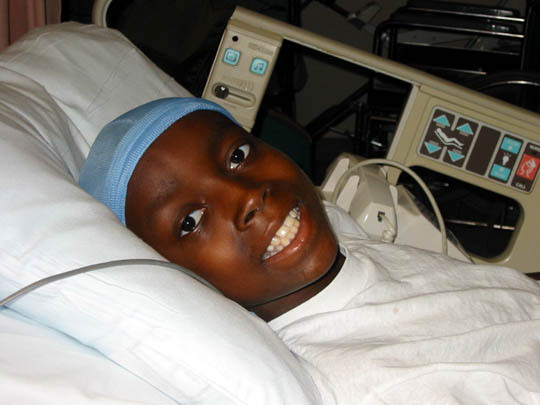 My name is Rashad and I hope that I'll get to go home very, very soon. I miss my family. My sister Crystal is 14, David's 18, Derrick is 20 and my little brother Marquise is only 3. I come right in between Crystal and Marquise, since I'm 11-years-old. I live with my Mom (she is the greatest! ), and my Dad lives in the same town. He works at a restaurant, and I get to help out there sometimes. It's great fun! My favorite things to cook are bacon and eggs! I love to play football and basketball, and plan to get a sports scholarship to Yale or Harvard when I'm older, or else I'll join the army. I have a lot of good friends, and I want to go back to school to see them, too. Do you like my do-rag? I'm the only one who gets to wear one at school because we have a pretty strict dress code, khaki pants and a nice shirt each day. I wear one because I don't have any hair...just for the time being. It came out when I was being treated for cancer. Here's what happened. Last year I discovered a lump in one of my testicles. At first I just figured it must be something all boys had, but soon I found out that it was a kind of cancer called rhabdomyosarcoma. When I learned about it, I was very sad, and my Mom and I cried. She helped me to understand, though, and she helps me go through all of the treatments, too, like radiation and chemotherapy. I don't think I get special attention because of my condition... Marquise does, though, I guess because he's only 3 and gets into everything. My brothers and sister wouldn't agree with me on that one...they think I get special privileges. For instance, when my stomach feels bad from the medicines, my Mom does my living room chores for me, and one of the kids will complain, "not fair...why don't you do my kitchen chores!". When I returned to school , some kids asked me what happened, and I told them I had an operation on my chest (sort of embarrassing to tell them about my testicle, don't you think?) I learned that because I got cancer, I get to make a wish that will actually come true, and my wish is for my whole family to go to Disneyworld. Can't wait!!! 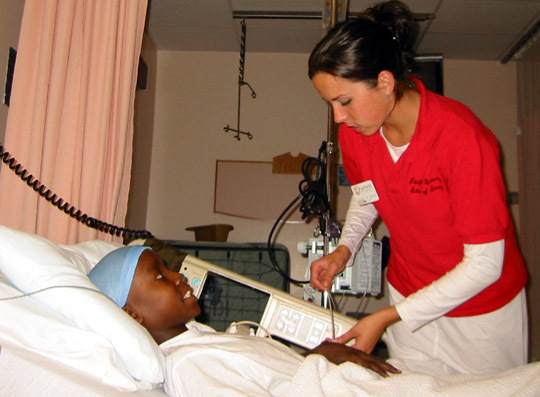 What do you think of this picture of my student nurse Jen taking care of me?